In our last post we showed this picture of Scott Merle visiting Pluma Hidalgo, Oaxaca. In Oxaca, there are three villages that make up La Trinidad – Lagunilla, Xanica and Los Naranjos. These villages comprise a coop of 300 coffee farmers. Our featured coffee is Mexico La Trinidad Peaberry. A peaberry is when one seed, rather than two seeds forms within the coffee cherry. 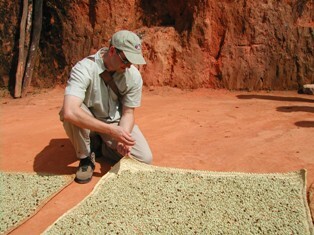 Peaberries generally have more intense flavor than the regular flat coffee seed. See coffee report here. We are serving the Mexico Peaberry made in a French Press. So, you could buy a press or 12 oz cup. The coffee has delicious notes of milk chocolate and cinnamon. Batdorf and Bronson has a long relationship with La Trinidad and was offered this limited edition coffee. We will continue to carry this coffee over the next couple of weeks. You can also purchase the Mexico Peaberry as whole bean too.